Police looking for witnesses to incident on Brighton Avenue on Sunday in OB. Intersection of Brighton Ave and Sunset Cliffs Blvd. Apparently, there was some kind of incident on Brighton Avenue in Ocean Beach last Sunday, the 26th of June, in the early afternoon. San Diego Police did investigate but up to now, nothing and nobody has been found to indicate to them that a crime has occurred. Police have confirmed that a number of 9-1-1 calls and other complaints came in about a white minivan traveling east on Brighton Avenue right around 12:30 pm, with yelling or screaming. One report has the minivan coming to a halt on or near Sunset Cliffs Boulevard, with a male Mexican driver yelling at a white, 40-something blond woman inside. A crowd of up to 20 to 30 people had gathered according to one witness on Sunset Cliffs Blvd in response to this incident. Another report had a juvenile – not a woman in her forties – involved. Some feared an abduction was taking place. One person thought it was “most unsettling”. Police did respond to the calls. 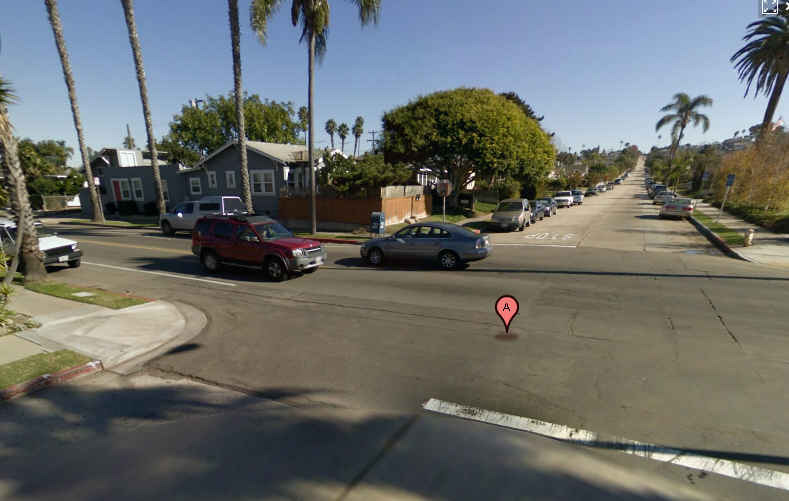 A patrol car was in the vicinity almost immediately, and a police helicopter appeared looking for the white minivan, and circled above Dog Beach. Police did stop several white minivans but none appeared to be involved with this incident. Because police have not been able to determine whether there was a victim or a crime, there is no detective assigned to the case. The SDPD would be very happy to speak to any one who was involved or who was a witness, or who has any info on what happened. They can call a general number, 619-531-2000. If you’d like to contact the OB Rag with info, you can either leave a contact in a comment or email us directly, at obragblog@gmail.com .